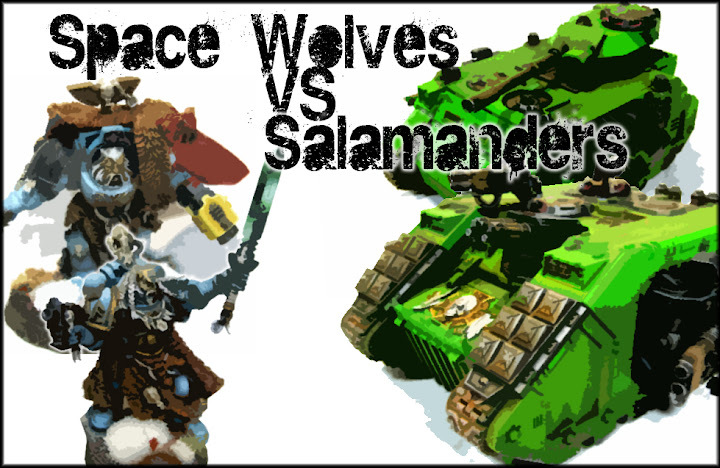 Space Wolves vs. Salamanders - 2k Battle Report! As a final showcase to these two beautifully painted armies, we pit them against each other in an epic battle royale. Both of these armies are extremely tough, versatile, and a lot of fun to play. Click the picture above to open up a Gallery with the full sized pictures taken during the exchange. 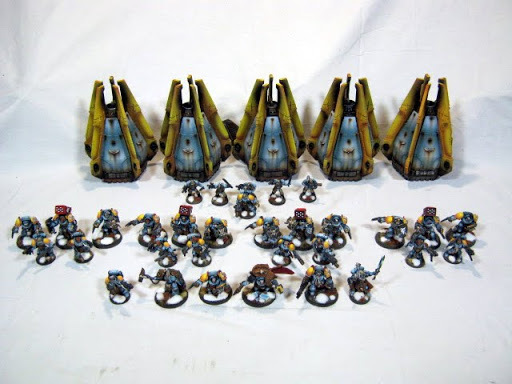 Click below to see the army lists used, lots of pics, and a brief summary. Necrons vs. Grey Knights - 2k Battle Report! Mike Haspil, author of APOCalyptic PRODuctions, came up to the crib to see how the new Necron Codex would fair. 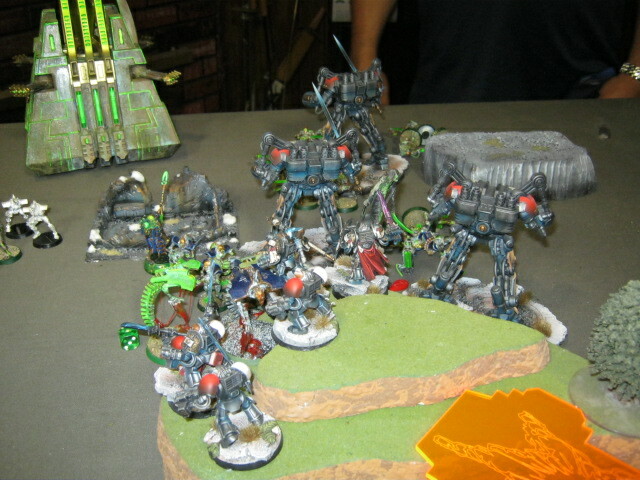 Mike has been playing Necrons for a long time and is famous for his LED lighted Monoliths he's brought to a couple Grand Tournaments. Unfortunately for Mike, he first played against Kenny's heavy weight Grey Knights army, and subsequently didn't have the best game. This particular flavor of Grey Knights hits hard and fast, leaving little room for error. Click below for Pics and a brief summary. They played a close, fun game in the ATC format. Kenny pulled it out in the end with an edge on Kill Points, tying Objectives and Capture + Control, for a 20-10 win. Click below for more pictures from this epic battle. Check out the mass of troopers assembled and painted for this latest commission. You'll notice in the above pictures, these Honour Guard have magnetized back packs and jump packs. They were also made from a large variety of kits to outfit them with their unique wargear of melta-guns and power weapons. Browse through the Gallery linked above to peruse almost 100 Blood Angels Infantry models. There are 16 Sanguinary Guard done in a striking bone white Angels Encarmine color scheme and 30 Devestators with blue helmets. The 30 Assault Marines, 3 Priests and 2 Librarians also come with magnetic back packs and jump packs for utmost list variety. Thanks for taking a look! 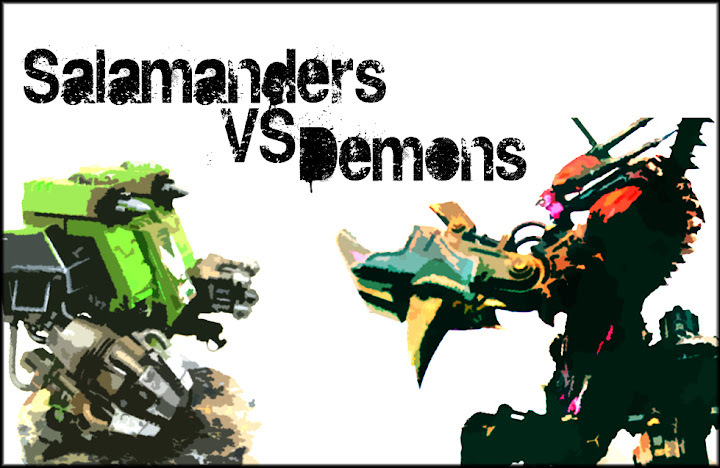 To feature the recently completed Space Marines Salamanders army, we ran them through the paces in a battle report versus Kenny's Demons. This game wasn't quite as close as our previous one, but still features lots of pictures of great looking models. This Space Marine Warhammer 40k Blood Angels army takes full advantage of all the amazing options offered throughout the Blood Angel line of models. The Assault Marine troops are all kitted out with Sanguinary Wings and Death Company bodies and shoulder pads. The Rhinos have extra armor and dozer blades represented by the Forge World Repressor kit. Resin bases were supplied by the client to make the force stand out even more on the table top. Many of these models were assembled from a combination of 3-5 kits to accentuate all the best parts of the intricate armor of the Blood Angels Elite. Click the pic above to open the Gallery to the most Blinged-out Blood Angels army we've ever done! People have been asking for it, and now it's finally here. The converted Warhammer 40k Daemon DOOM army has been fully fleshed out with the rest of the troops and creatures. These converted models, all inspired by various villains from the video game DOOM have come to life in model form to ransack the tabletop. For example, 'Pinkies' are converted from multiple miniatures, given cybernetic customizations, and represent the fearsome BloodCrushers from Warhammer 40k. The flaming skulls count as Screamers of Tzeencth, and play a similar role in both games. 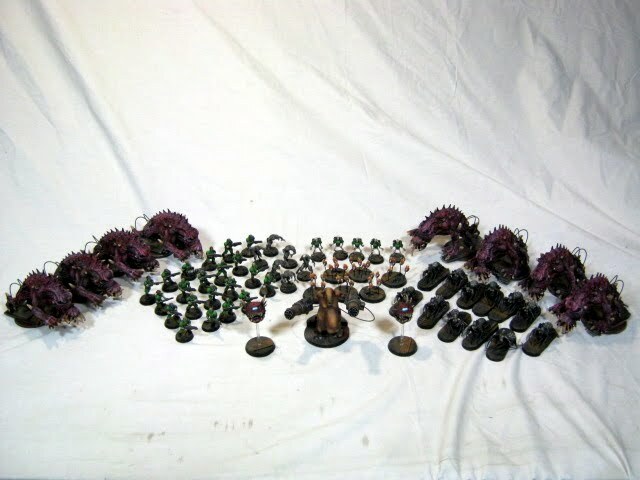 Be sure to click above to open the Gallery and see this army up close. To culminate our series of 'Work in Progress' posts, we present the inaugural battle of Logan's Drop Pod Space Wolves. They are facing off against my Blood Angel Lamenters for their final battle (the army was sold shortly hereafter). The game was fast and furious with lots of mutual carnage and destruction. Many interesting tactics were employed throughout the match, making for a nail biter of a game that was still in contention till the last turn. Click below for Pics and a brief summary. Finished! The Drop Pods sport an alternative paint scheme with burnt yellow on the fins to represent their descent from orbit and the Veteran status of this custom army. This force was done as a side project between other commissions and allowed us to really savor the creation process step by step. Kenny also included a plethora of extra details and highlights to make the miniatures as characterful as possible. Logan Grimnar leads his hand picked Wolf Guard into the fray with a gruesome opening salvo from space. Click below for a series of pics and the Army Roster List! Four custom models from Games Workshop Warhammer 40,000 and Lord of the Rings lines converted into the villains from the video game DOOM series. 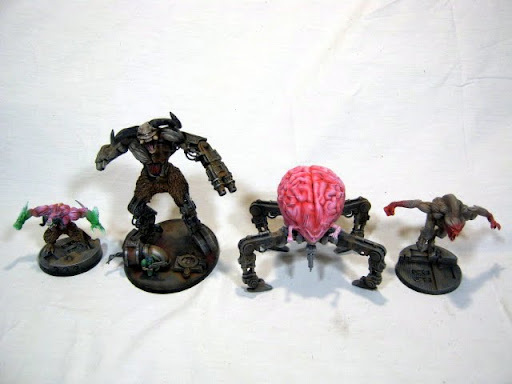 The Cyberdemon and Mastermind opponents from DOOM inspired the Soul Grinder conversions. The Daemon Prince of Tzeentch has green flame to represent the classic shooting attack. The Baron of Hell and Hell Knight are made from the Daemon Prince and Balrog kits, while extensively converted with green stuff modeling putty. Check out the full progression in our Gallery. Space Wolf Scouts sneak in to this week's update with their Wolf Guard veteran. The Scouts provide an awesome distraction element and demand the opponent take measures to defend against their ability to come on the board from the enemy's table edge. The Space Wolf kits provide extra heads to swap with the standard Space Marine box kit. These models are an enormous improvement on previous sculpts, and are a joy to paint up and display. The third squad of Wolf Guard are presented ready for battle. 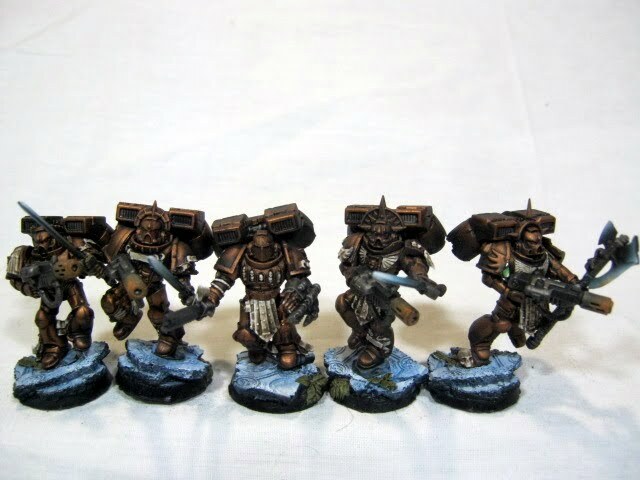 The smooth fades of the shoulder pads give a unique look to theses veteran Space Marines. In contrast to a flat color, these blends highlight the textures and details incorporated into the molds. In the pictures below you can also see the transition of the figures before being washed to the finished product. The shadows and darkened areas are created by allowing the wash to naturally flow through the recesses of the models. Logan, his crew, and the first two squads of Wolf Guard make their appearance. One of the great things about these models are how customizable and unique each figure can be. The Space Wolves plastic models especially lend themselves to having a lot of visual variety throughout the army. In this case, Kenny decided to use all non-helmeted heads to represent the veteran status of each character. 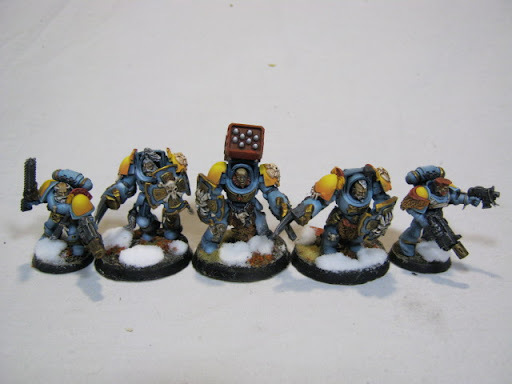 These first finished models have extensive hand blended details to accentuate the individualistic nature of the Space Wolves Space Marine Chapter. When Logan Grimnar and Arjac Rock Fist drop, they make best use of both their abilities and augment the assault cannon and psychic powers of the Rune Priest. The other Wolf Guard drop pods afford many opportunities between their plasma and melta shots. The grey tone and hue of blue in the Space Wolves' armour is contrasted by the shade of orange blended into the yellow of the shoulder pads. We wanted to show a little more of the process behind creating an army project, and so begins a new series of posts documenting some of the steps and stages. Kenny wanted to make a personal project that he has been contemplating for a long time. “Ever since the Codex came out,” he's been chewing over options and possibilities. 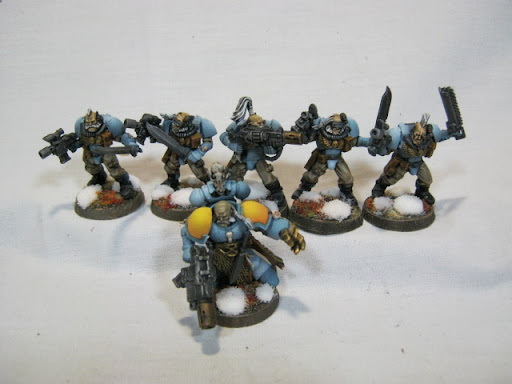 The army had to be different, yet very characteristic of the Space Wolves as a Chapter. He decided on a list featuring Logan Grimnar and Arjac Rock Fist descending in Drop Pods with their Wolf Guard brethren. Almost every model has been extensively converted to represent the specific weapons and wargear for each Space Marine. New iron comes forward to join the line. The Adeptus Mechanicus utilize ancient technology to take hold of the objectives and defeat the enemy. A unique combination of colors and models compose this force made by MBG. The various turret options allow him to play with Rhinos or deadly Razorbacks with shots of their own. The Land Raiders were made with multiple magnetized side sponsons to be converted from Crusaders to Redeemers by Spikey Bits. The army can crash through enemy lines and bring Imperial mercy to any foe. The new Finecast range of GW models were used in this addition to a preexisting army. Having painted many of the metal plague marines, the resin were better. They were more accepting of wash and gave greater gradation of shadow. Assembly was a mixed bag. On many of the models there weren't just mold lines, but mold misalignments. These required re-shaping the model to become smooth. However, glue adhered quickly and more solidly than with plastic or metal models. The Nurgle Prince used to be especially difficult to paint, being a bowling ball of brokeness. Now he's a joy to paint up and play. Riding aloft their fast moving skimmer tanks, the Eldar take the field with lightning speed and grace. Multiple Wave Serpent troop transports sport heavy Bright Lances to pierce the armor of enemy vehicles. They are loaded with Biel-tan Guardians, conscripts in the war for survival. A Falcon skimmer tank carries a deadly cargo of a Farseer and his Warlock Council all armed with singing spears. Once disembarked, they will make short work of any target in their sights. A band of Saim-Hann jetbikers and Vypers add their guns and velocity to the force as well. This army was listed on eBay and sold to a customer in France who will hopefully have many great games with it. Calgar's contingent of First company marines in his custom Land Raider Crusader roll out to engage the enemy. Bolstered by the Tactical Squads in Rhinos, they seek out and defend objective points. The Predators provide fire support along with the Land Speeder Typhoons. On first turn, a Drop Pod will land with a Dreadnought to disrupt the enemy lines and take out any key element with his multi-melta. The Vindicator is one more tank hunting for targets of opportunity. The paint job and modeling are custom made and detailed for this army. This commission was inspired by modern military air cavalry and painted in the chapter colors of the Raven Guard. The standard Space Marine Scouts heads were swapped with Imperial Guard Veterans to achieve a more militaristic look. The smooth blends of khaki on the helmets really accentuate the conversions and bring the models to life. Three units of Scouts in Land Speeder Storms make for a really interesting and mobile troop element to the army. They can be sent ahead at the start, or held in reserves for late game objective grabbing. A really fun force that came together brilliantly. Another project in development. This Dark Eldar force was begun in conjunction with an apprentice painter to develop the Next Level Painting techniques. The army is a work in progress that will grow over the coming months to showcase the Games Workshop 40k Dark Eldar models. Here's the final product, all ready for this weekend's tournament. It should be quite a lot of fun to play, and the paint job came out really nice. We've gotten quite a few compliments and a number of inquiries about this particular Grey Knights army. I calculated that to commission the painting of an identical force would run $790.00, and for painting, model purchase and assembly it'd come to $1395.00. This list could of course be modified to match any specific army. Click below to see the full army list for this Saturday. The Vehicles (2 Rhinos and a Storm Raven) got done first. Kenny was able to experiment with different colors and textures. A recent painting and assembly commission of the Chaos Battleforce Box to be used for game demonstrations. This modest army features a variety of colors and schemes by utilizing all the various Marks of Chaos. Especially vibrant are the blue Tzeentch Possessed Chaos Marines, and their added icon increases their invulnerable save to 4+ on a D6. This makes the unit a formidable force in close combat and a great complement to the other units. We also converted one of the models to represent a Lord to make a legal small army for play and game demos. This army was commissioned by Rob Baer and was done in time for the Gladiator Tournament at Adepticon. It was originally conceived as a six Dreadnought Adeptus Mechanicus contingent, and took on some of the colors of the Blood Angels which was the parent codex rulebook used to represent the force. The conversion work done by Rob was outstanding, especially on the Space Marines that included bionics sculpted from old Necron models. You can see more about this army on the Spikey Bits Blog in the run up to Adepticon Here and Here. Congratulations go out to our very own Kenny Boucher, who won the 2011 Adepticon Team tournament along with Team Spikey Bits/WC. 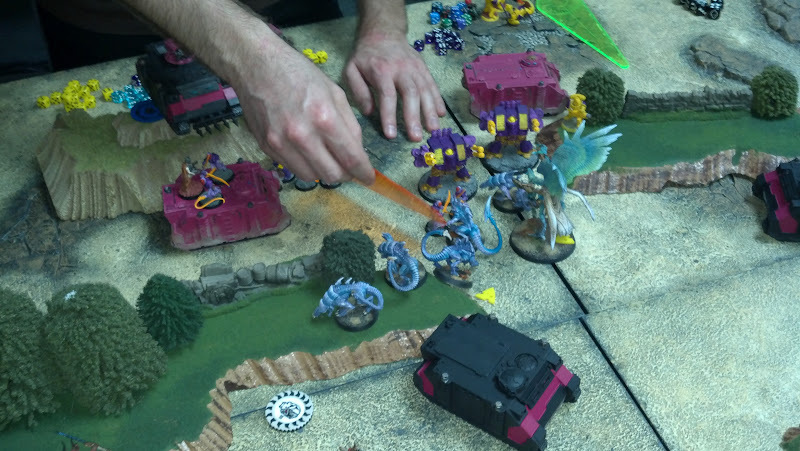 This year Adepticon hosted over a hundred teams with four players on each team. The tournament is easily one of the largest and most competitive in the world, and we are immensely proud that our resident painter was able to represent and bring home the big Win. Well Done Kenny! This is a personal army project completed in between commissions. It features a Bloodthirster and Khorne Daemon Prince from the Ultraforge model range. The linchpin of the army is a large Bloodcrusher unit that is tough, resilient and eats everything in its way for lunch. The Skulltaker and Herald of Khorne are converted from original Berzerkers riding Juggernauts with green stuff sculpted onto them to signify their ascension. The reds have been reverse highlighted to represent the Daemons rising from the Warp and riding into glorious battle. Below is a Battle Report featuring this army from the first Feast of Blades Final Championships. Enjoy! Grandpa Nurgle, Lord of disease, pestilence, and purulence. The Great Unclean One sends his followers to reinforce the fight with the Imperium. Desecration surrounds these elite troops carrying melta guns, combi-meltaguns, and mighty Obliterators. The crates and barrels signify the objectives these forces seek out and are determined to win. More repeat business from a previously satisfied customer. This time it's Orks adding to an already existing force of Deff Skullz. They should make a big splash with the added mobility and the destruction the Deff Rolla' Battle Wagonz can deal out against enemy vehicles. The Trucks too will make sure and get the Boyz where they need to be, and delivering whatever mayhem they might bring. Check out these recent additions to an existing army. The Star Wars Space Marines get added firepower in the form of a Vindicator, 2 Landraiders, and a Dreadnought. The Dozer Blades are magnetized to the chassis of the Rhinos. They can be removed or added for a variety of lists. We love repeat customers, and went so far as to paint this over the weekend so he would have it for the Con. I realize that everyone has a different approach to 40k. This article is simply my approach to the “Descent of Angels”, specifically regarding the Storm Raven. First off, lets discuss the “load out” of the Raven. I will always utilize extra armor and thus its my american express card, “never leave home without it”. As far as weapons go, I always take the twin lascannons and twin multi-melta. It is cheap and effective at cracking open some tanks. The infantry is my “anti-infantry”, so I don't take the “Lawnmower” set up, but the amount of shots it has is very impressive. A devastating band of piratical raiders descend on to a hapless populace. The raiders make short work of any infantry, and the ravagers obliterate any armor. The distinctive colors make sure the enemy remembers their beating, and lashes their victims into relinquishing more pain. The painting fades and highlights throughout the army, bring out the details, and accentuate the wash effects to make for an outstanding force ready to decimate any opponent. An intimidating amount of armor thunders across the battlefield in this fast Blood Angels tank company. The Blood Angels are unique in there ability to have more heavy tanks than other Space Marine armies while also being empowered by overcharged engines! Each vehicle has been highly individualized with iconography and free hand painting in addition to the modest weathering effects on the tracks. Open the gallery to see close ups of all these awesome vehicles..
A converted Warhammer 40,000 army using models from the Space Marines GW line and the Star Wars miniatures game. The figures have been magnetized in multiple places by the client so they can represent various factions from the 40k universe and their unique play styles. It also incorporates aspects from Star Wars fiction such as the 501st, Vader's Fist, and the Clone Wars. The All Terrain Scout Transport represents a Space Marine dreadnought, and the scorching effects are emblematic of a battle hardened force. A tournament tested Warhammer 40k army, built to be one of the most competitive Codex Space Marine forces available. This army offers a plethora of solid Space Marine entries that take utmost advantage of the options available. Vulkan He'stan leads the detachment and boosts the power of the army's Thunder hammer Terminators, and the plethora of melta guns and flamers throughout the army. 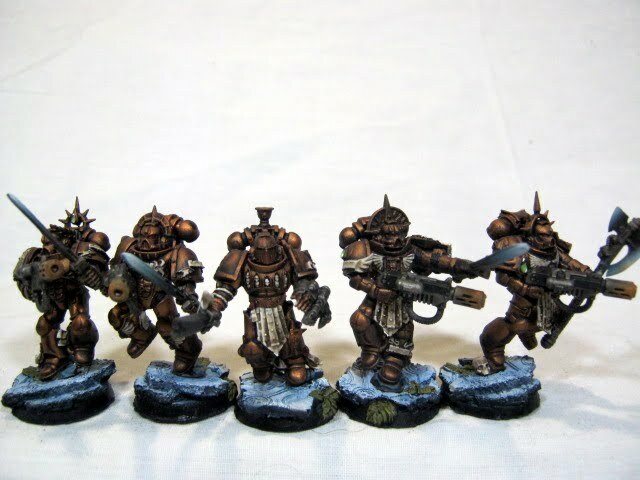 Each tactical marine is also modeled with an out of print Salamanders shoulder pad, and the corrosive paint effects represent being from the volcanic world of Nocturne. This army should prove to be a formidable contender in any arena, be it painting, playing, or modeling. 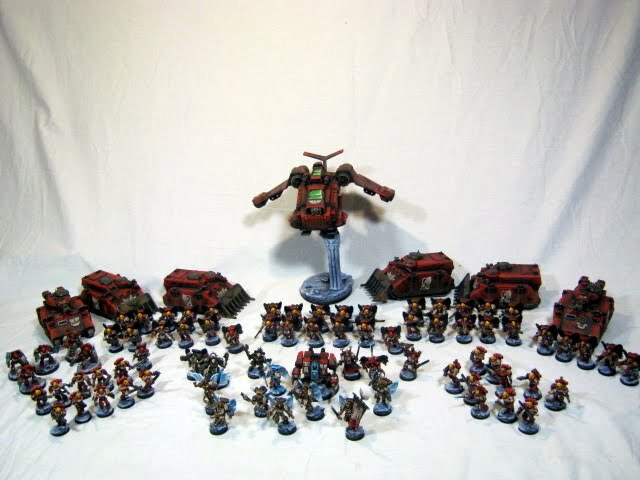 This totally unique force is a client's custom Ork army to count as “Looted Blood Angels”. 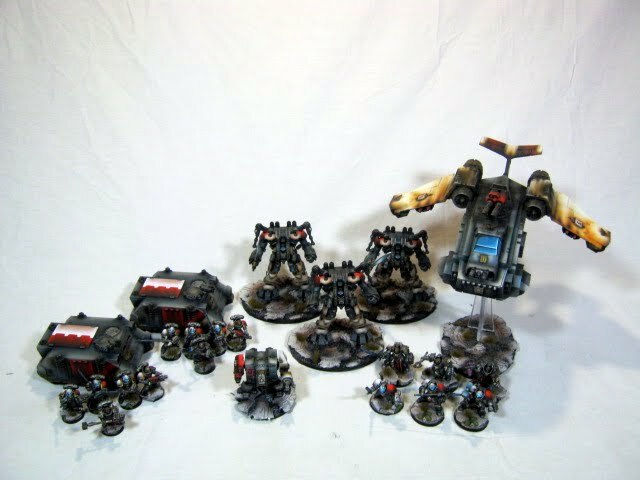 The converted vehicles represent various transports, tanks, a dreadnought, and a looted Storm Raven. The units include a number of Warhamer Fantasy models in heavy armor to show the increased resiliency versus incoming fire. Extensive use of the airbrush allows smooth transitions in color to achieve the metallic blends and rust effects, as well the flame bursts. The final stages of hyper highlighting brings out all the details of the Ork skin and completes this suitably scary Warhammer 40k army. 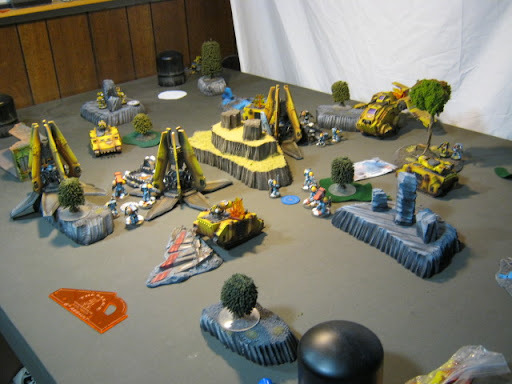 Check out this link to a friend's blog that narrates a monumental battle between the Space Marine Blood Angels featured earlier, versus Space Wolves, all atop the fine scenery and terrain pictured in our last post. It's a very engaging read with numerous action filled photos. Enjoy!